Automatically put the current apiomat.js-file of the application into the filesystem of the web-fronted deployed on the webhosting-module. The module works as an post-request as it modifies the content on the server. The Module depends on the module "Webhosting"
The name of one valid customer of this server has to be transmitted. 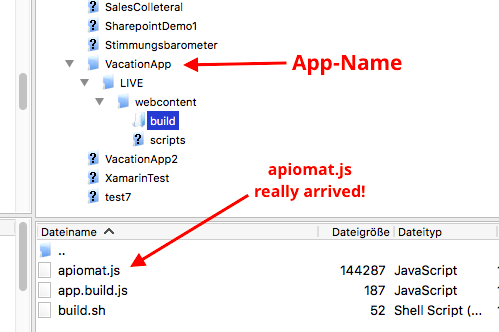 This indicates the path where the apiomat.js-file should be put into the filesystem of the webhosting-module. For example, let's say you have put your frontend into a zip-file named "webcontent.zip" and you would like to put the apiomat.js into the subfolder "scripts/vendor/apiomat/". 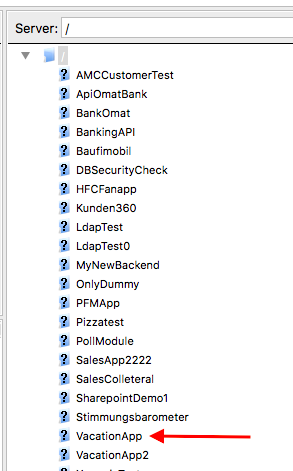 Just put the name of the zip-file infront of this path to form "webcontent/scripts/vendor/apiomat/". Your webfrontend compressed into a zip-file, transferred as binary data. Configure YAMBAS to use the WebAppUpload Module. To avoid conflicts with library versions you have to set a flag in the apiomat.yml file unter yambas: . Before using the module, you have to add it to your application via the dashboard. Here you have to put in the .zip-File with your web-frontend as binary-data! Using the Apache http-Client library: https://hc.apache.org/httpcomponents-client-ga/index.html . This step obviously is optional. 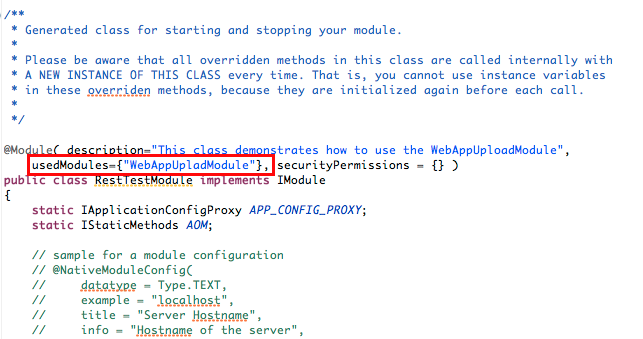 Include the "WebAppUploadModule" in the "usedModules"-Annotation of your <moduleName>.java-Class. Now you can use the Method "UploadHelper.uploadContentToWebhosting( ... )" which triggers the same upload-process as described above. This is an example on how to call the method from any method. Attention: The example assumes that there is already an incoming request and httpServeltRequest you can use. If not, you have to create your own! !